NGA Tour member Hudson Johnson graduated from Vanderbilt in 2010 with a degree in economics. He is second on the Vanderbilt golf team’s all-time win-list behind PGA Tour winner Brandt Snedeker. 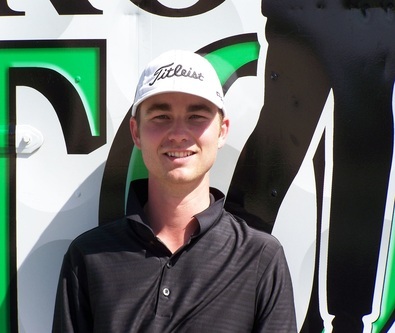 In his rookie season on the NGA Tour, Johnson won the Timber Creek Classic in Daphne, Ala., and also claimed the Members Only Shootout, which paid for his entry fees into all NGA Tour events in 2012. This week, the NGA Tour returns to Timber Creek Golf Club and Johnson looks ready to defend his title. The easy-going and affable Texan sat down for an interview today following his strong opening round of 5-under 66. You’re the defending champion here at the Timber Creek Classic. What has winning on the NGA Tour done for your confidence? I’ve noticed with myself that at each level it takes some time to get comfortable for some reason. As soon as I feel like I can compete, I start playing better. I’d started playing well [prior to the 2011 Timber Creek Classic], and I played with some of the guys that were winning out here, and I thought — I’m not saying I am better than them, but I can play with them — that on a given week I can be better than them. I had a good finish the week before at Hawkinsville (Ga.) coming in here, and I came in feeling good. Then when I won it was like, alright, I can do this. And that’s essentially what I want to keep trying to do: Feel like whatever level I get to, see who the best is out there and try and compete with them. Do you think that is what makes the NGA Tour so valuable? The fact that it allows players to compete against professionals at this level, which the average golf fan might not even be aware of? The thing is, if you take the top-10 guys out here on the NGA Tour, they are good enough to play anywhere. One or two of them are going to play at the top of the Web.com Tour and the top of the PGA Tour. Just look at Ted Potter Jr., who won the Greenbrier Classic two weeks ago and was a two-time winner on the NGA Tour in 2011. Exactly. At any given time, you’re playing against the next Ted Potter, or you could be the next Ted Potter. What is your most memorable experience of playing golf at Vanderbilt? Easily my freshman year, when we qualified for regionals out in Tempe, Ariz., and we were out of it by four or five teams going into the last day. As a team on the last day we shot 21-under — just absolutely blazed them — and ended up qualifying for nationals. But that last day was awesome. We came in and everybody was like “boom, boom, boom.” It’s fun to win something on your own, but when you have that team aspect and everybody’s pumped up about it and like, “Hell yeah, we just did that,” it’s more enjoyable to have people to celebrate it with. Do you still follow Vandy sports? Some, yeah. I like sports, and I have my teams. I was friends with a lot of guys on the football team, so the first two years out, I watched a lot more football games than I do now, same with basketball and baseball. I kept up with my buddies more than I kept up with the actual team. But I of course still like watching the games and going to as many as I can. You’ve been called “the most interesting man on Twitter” but you recently deleted it, why? I think several reasons. One, I was just getting tired of being on it all the time. I guess I realized that it is a fault of mine — like how if you’re an alcoholic, you can’t drink alcohol — and I was becoming a Twitter-holic. Everyday I would constantly be checking it. I didn’t like that. On top of that, I felt like I was way too caught up in social worlds and realms that I was no longer a part of [laughs], so I needed to get out of it. I am worrying what these people are reading when I tweeted, and I am not seeing this person but once a year. It was making me too self-conscious. You recently started wearing button-up golf shirts more than traditional golf polos. What is your reason for that? I just felt like wearing something else for a little bit. Who knows, and this could be a little premature [laughs], but when I am able to get out there on the PGA or Web.com Tour, maybe I can sign a clothing deal and start making some stuff like that. That’d be cool. I don’t like golf shirts. I think they are boring. The route now is everyone is going bright, like Rickie Fowler and all that, all these loud colors. I am not into that either. I’ve always liked old-school clothes. I would like to eventually get it to how guys used to look, like Sarazen, Hogan and Nelson. Those dudes had a sharp look about them. Just the tailored, sharp look that I wish they would start making. I don’t know, maybe I can help break that ground somewhere. Button-ups that look good, but that are also performance oriented, because most of those old-shirts weren’t. What are the biggest strengths and weaknesses of your golf game? It’s kind of both. I ride waves. So, when things are going well I can get them to go really well. Unfortunately a lot of times, when things go poorly, they can go really poorly. If you had to look at me from the outside, you’d say I am mainly a ball-striker and if the putter gets hot, it gets good. Weaknesses are mainly short game and putter. Sometimes it’s really good and sometimes it’s really not. So I would say consistency more than anything. I think most of that is mentally learning how to stay comfortable. What is something that the average golf fan might not realize about being a professional golfer? It’s a great job, but at the same time it’s a lifestyle. Everybody’s like, “Oh you play golf for a living,” but they don’t realize it’s a lifestyle. It’s not like I am out here four days a week hitting golf balls and other than that I am doing nothing. I am out there all day, every day. Everybody is. Most of these guys work out; we watch what we eat. I guess it is just not as easy as everyone thinks it is. It’s not just loafing around. Don’t get me wrong, there are guys at every level who are just kind of loafers who don’t do much, but for the most part, you aren’t going to find a dude out here who is really lazy, except for the people that don’t really want it. The time off maybe is good, but dealing with the pressure day in and day out for 30 weeks a year puts a strain on you. It’s like working out. The first rep, the first bench press you do is fine. But if you do that 30 times at max weight, you’re going to be worn out. It’s a lot more taxing mentally than people realize. If you could win any professional golf event in 2013, which would you choose? Obviously if I told said you’d win a U.S. Open next year you wouldn’t argue? Yeah [laughs] I wouldn’t argue with you. I mean the U.S. Open is awesome. The PGA Championship is great. It’s a major championship so of course you want to win it, but at the same time if you don’t play golf, you don’t watch the PGA as much compared to the other three. But if you said I could win the PGA, heck yeah. I don’t think Keegan Bradley is upset at all that he won the PGA [laughs]. The British Open you have to show so much character and grit. Same with the U.S. Open. But if I had to pick one it’d be the Masters. Because it is the freakin’ Masters. Your dad played baseball at Baylor. Did that athletic background help you get started in sports? One thing a lot of people don’t know about me, is that my dad is not actually my biological father. My real dad died when I was seven from a brain tumor, and my mom remarried when I was nine. But he adopted me, so he is my dad. Everybody around here knows him, and they sometimes call him Mr. Johnson, even though it isn’t his last name. But I don’t mind, and he doesn’t either. He’d never correct you. When I started picking up golf and getting into it, he was very influential. He has always been a hard worker. So he has always stressed that. From the get-go at an early age — I started the year before high school really, so I didn’t have much experience — he was good with how he went about it. He said. “If you want it, you need to work at it. You need to catch up to these guys.” But he didn’t stay on me and drive me or anything like that. It was very cool to have him there. That competitive nature he has, we share that. The Olympics start tomorrow, do you think Olympic golf in 2016 is something that is going to be viewed at as important to the big names in the golf world? Will it be high on the list for a guy like Phil Mickelson or Tiger Woods? I don’t know why it wouldn’t be. You’re representing America against the rest of the world at the Olympics. That’s tight. How badass would that be? I would definitely, love to play in the Olympics. Not even for the golf aspects of it. Just the fact that you are representing the U.S.A. in the Olympics would be really cool.